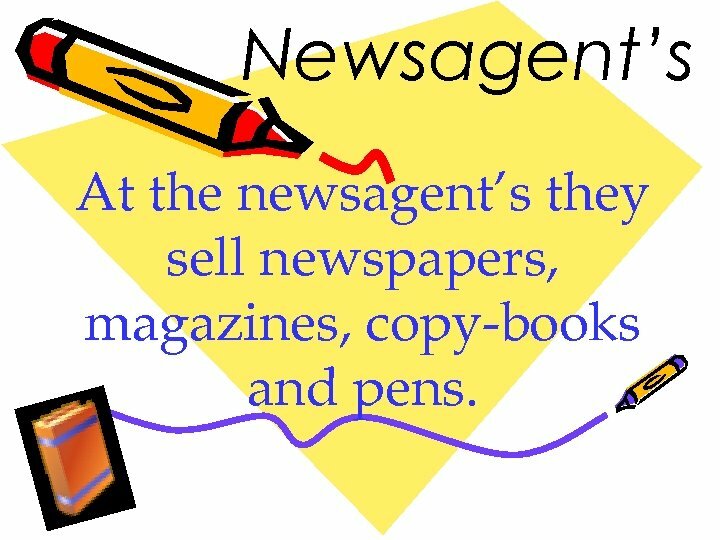 Newsagent’s At the newsagent’s they sell newspapers, magazines, copy-books and pens. 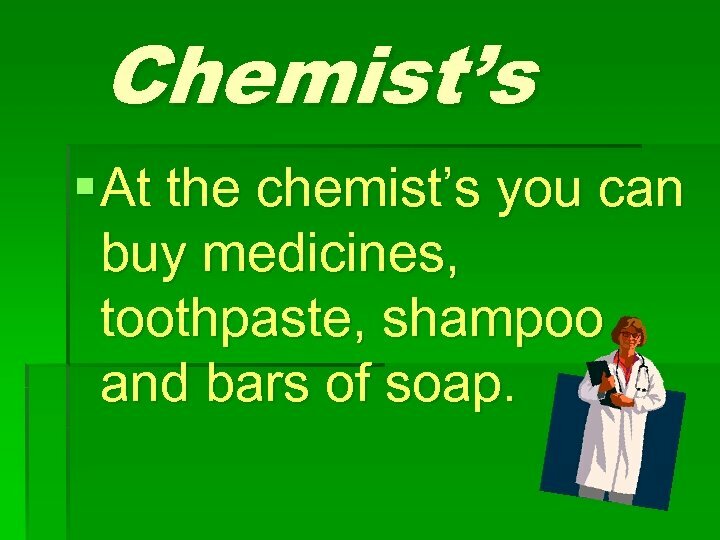 Chemist’s § At the chemist’s you can buy medicines, toothpaste, shampoo and bars of soap. 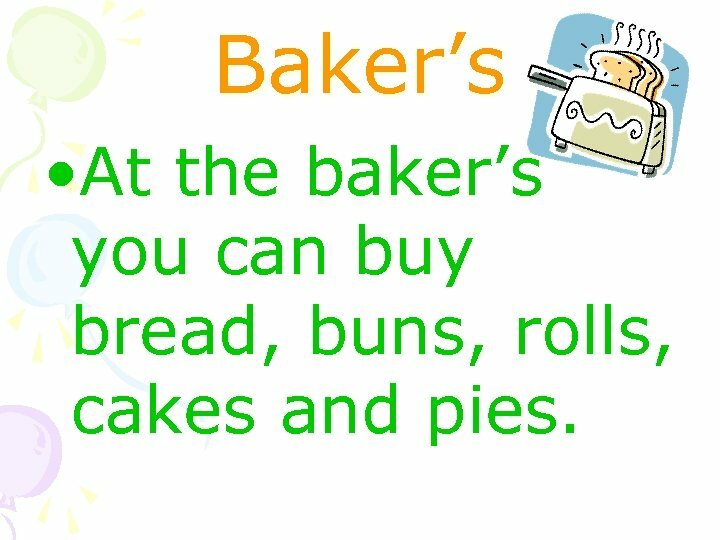 Baker’s • At the baker’s you can buy bread, buns, rolls, cakes and pies. 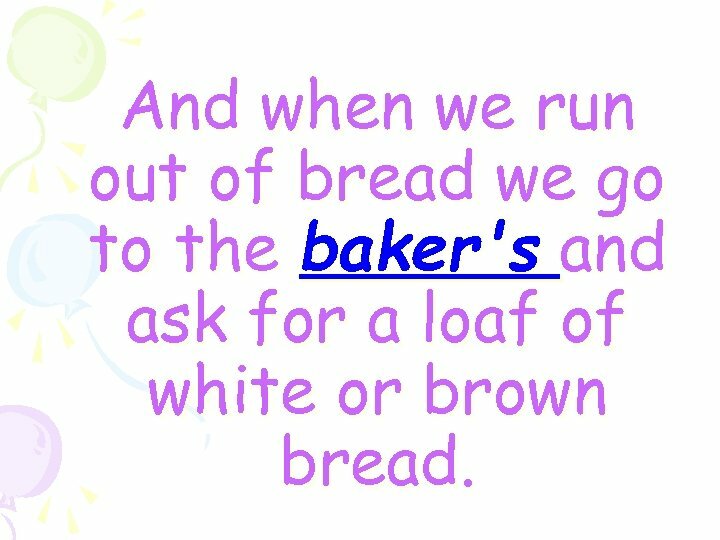 And when we run out of bread we go to the baker's and ask for a loaf of white or brown bread. 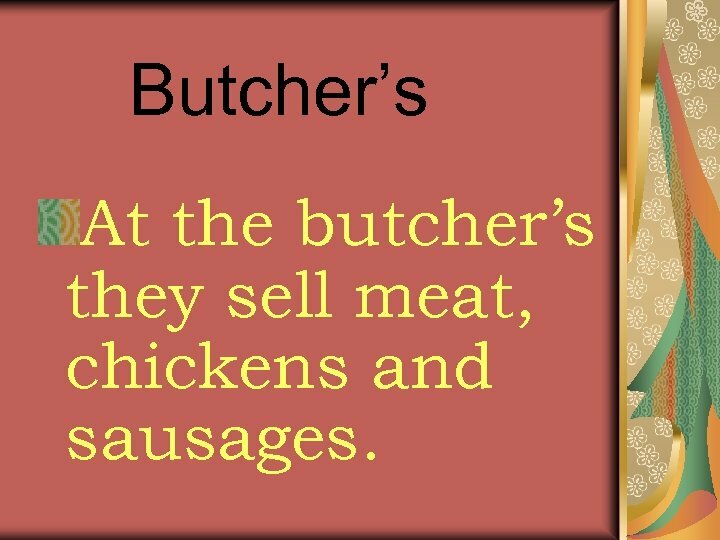 Butcher’s At the butcher’s they sell meat, chickens and sausages. 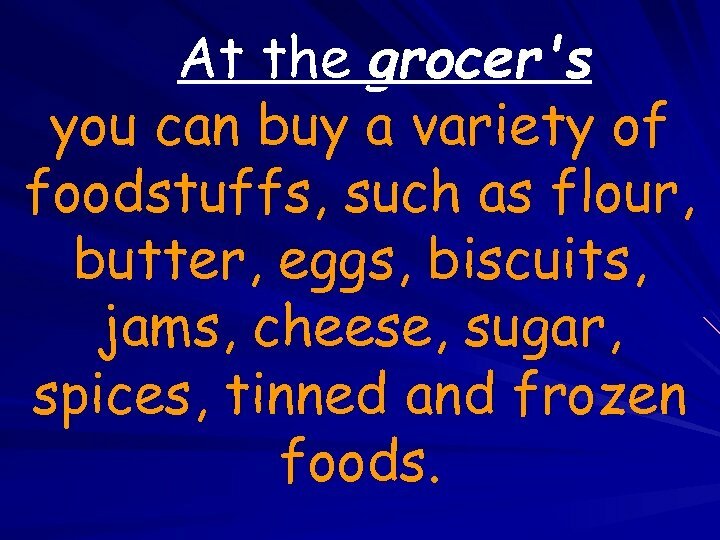 At the grocer's you can buy a variety of foodstuffs, such as flour, butter, eggs, biscuits, jams, cheese, sugar, spices, tinned and frozen foods. 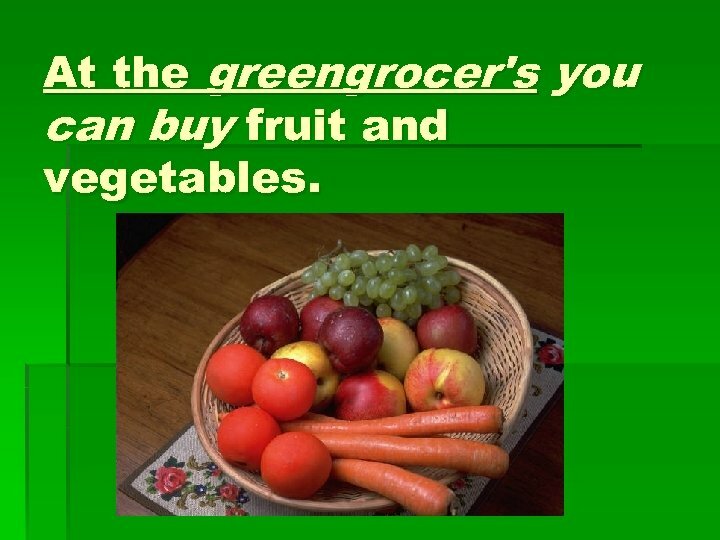 At the greengrocer's you can buy fruit and vegetables. 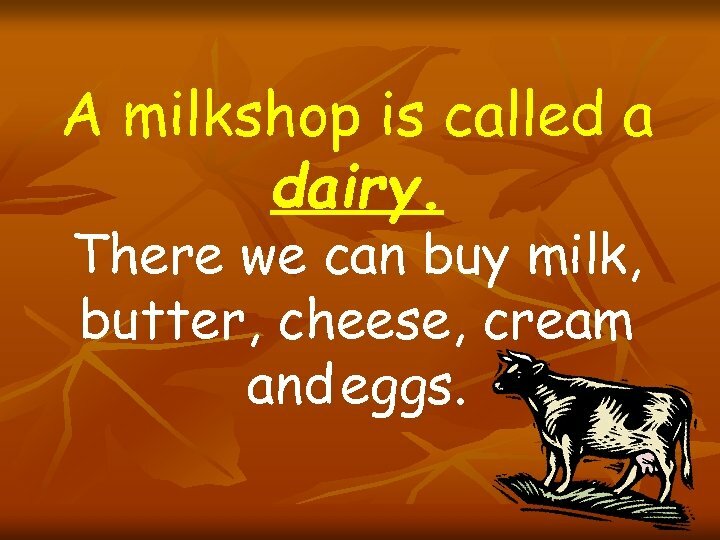 A milkshop is called a dairy. 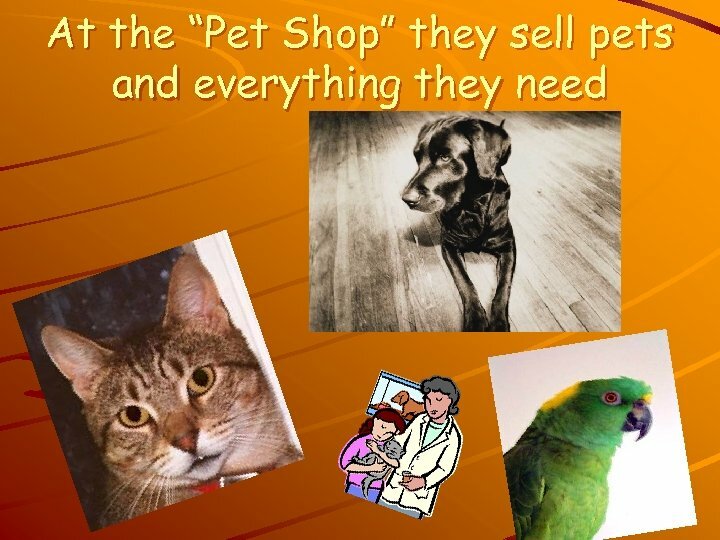 There we can buy milk, butter, cheese, cream and eggs. 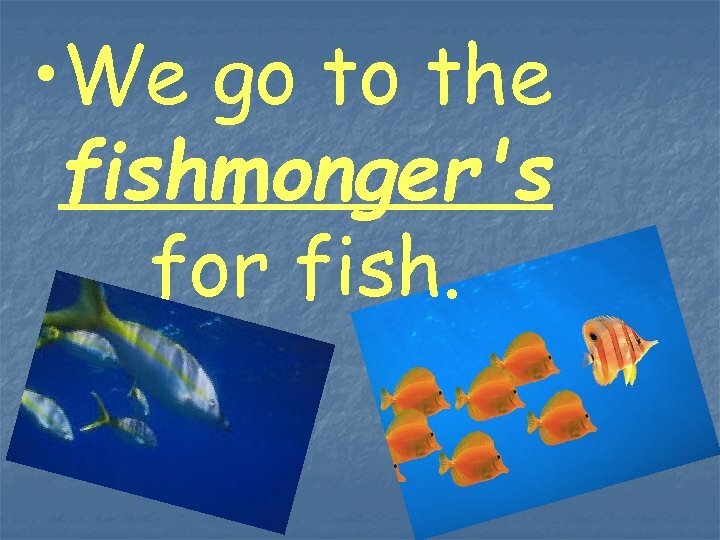 • We go to the fishmonger's for fish. 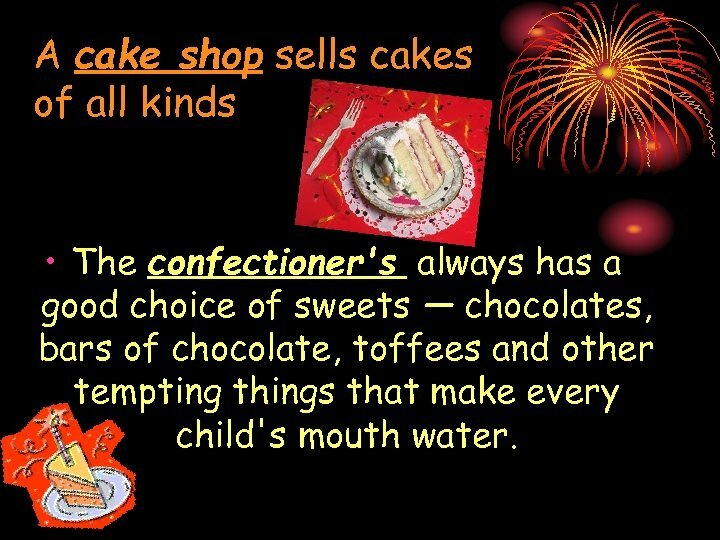 A cake shop sells cakes of all kinds • The confectioner's always has a good choice of sweets — chocolates, bars of chocolate, toffees and other tempting things that make every child's mouth water. 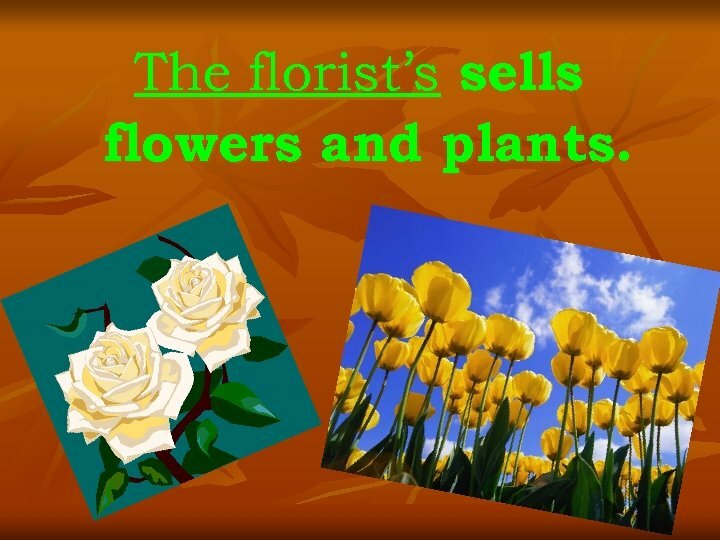 The florist’s sells flowers and plants. 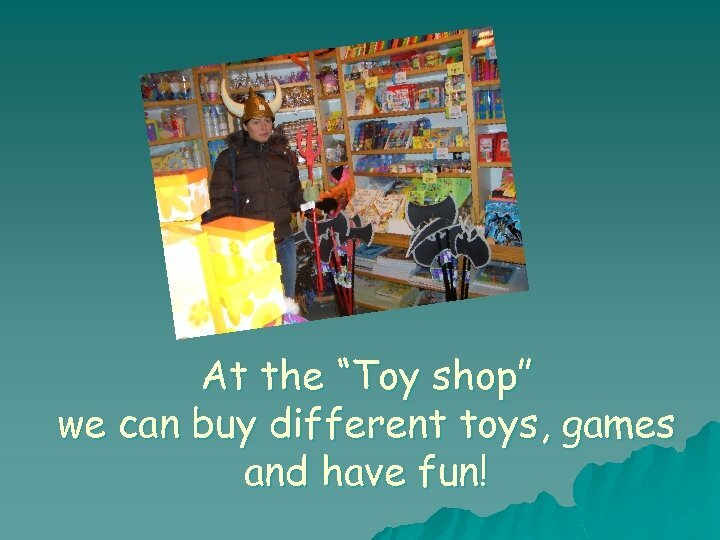 At the “Toy shop” we can buy different toys, games and have fun! 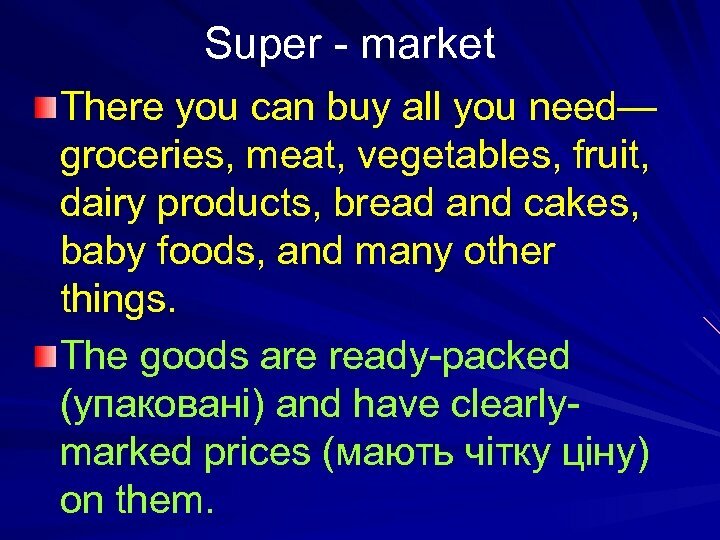 Super - market There you can buy all you need— groceries, meat, vegetables, fruit, dairy products, bread and cakes, baby foods, and many other things. The goods are ready-packed (упаковані) and have clearlymarked prices (мають чітку ціну) on them. 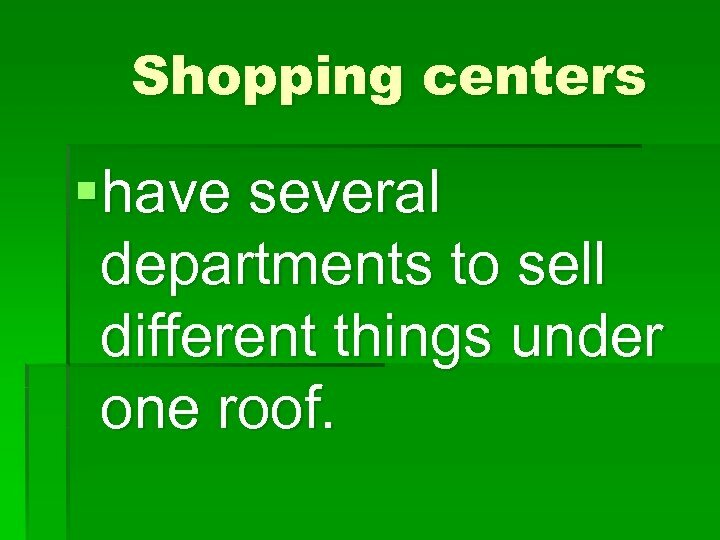 Shopping centers §have several departments to sell different things under one roof. • Try this pair on. They are the cheapest, the lightest and the most comfortable. • Can I help you? 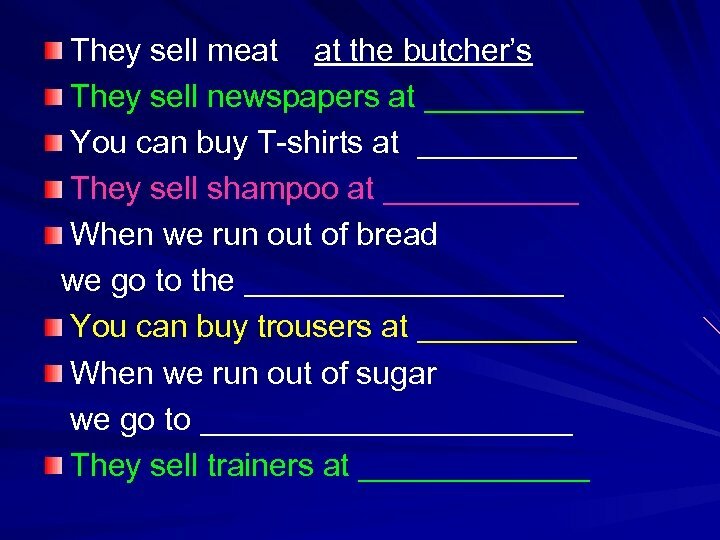 (1) • How much are they? • Size 28, I think. • £ 17. • Oh no…they are small for me. • What size? 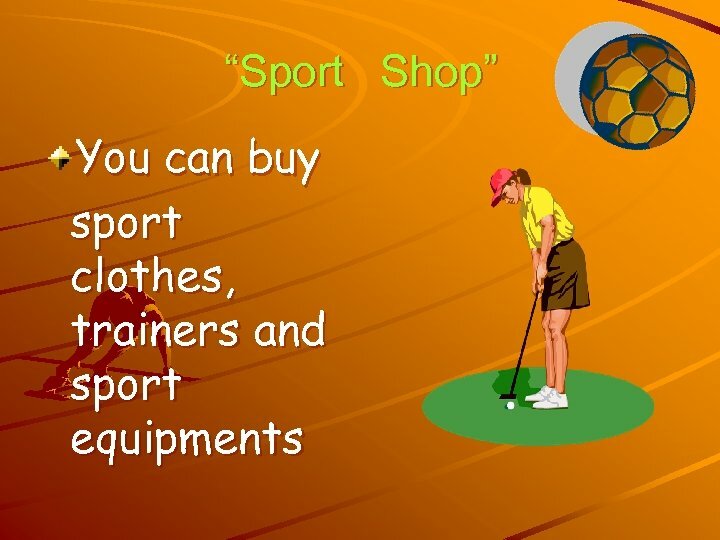 • I’d like a pair of trainers, please. 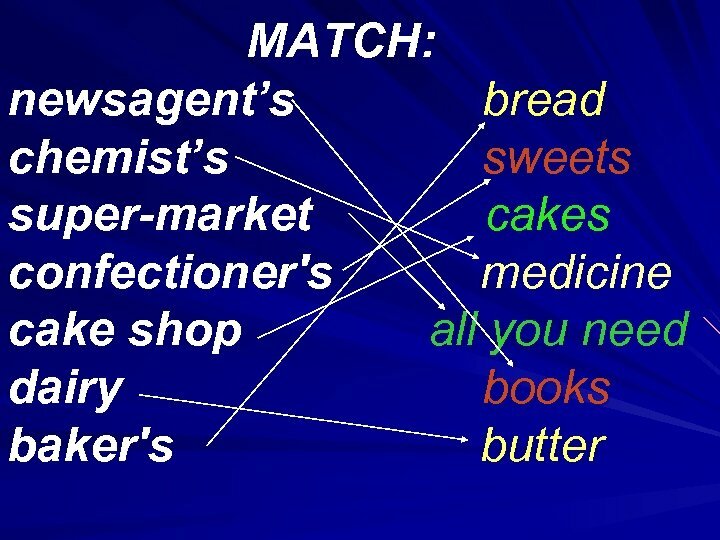 • Try this pair. They are bigger. • Thank you. Goodbye. • Yes, it is nice and comfortable. • It is £ 10. • Yes, you can. 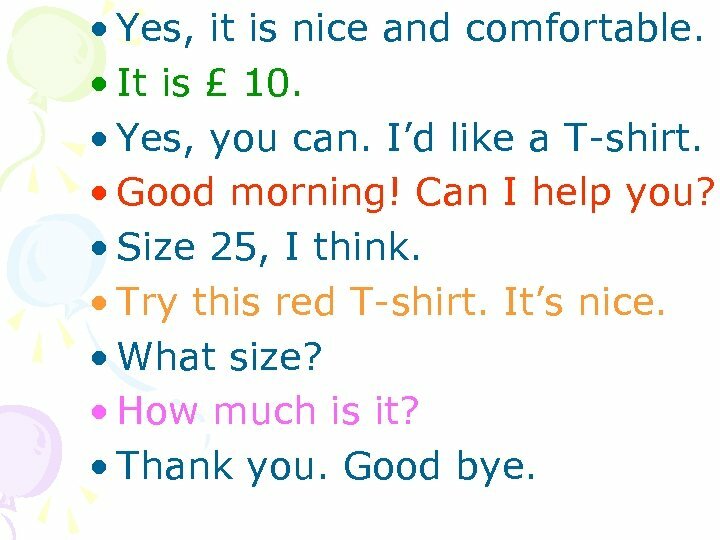 I’d like a T-shirt. • Good morning! Can I help you? • Size 25, I think. • Try this red T-shirt. It’s nice. • What size? 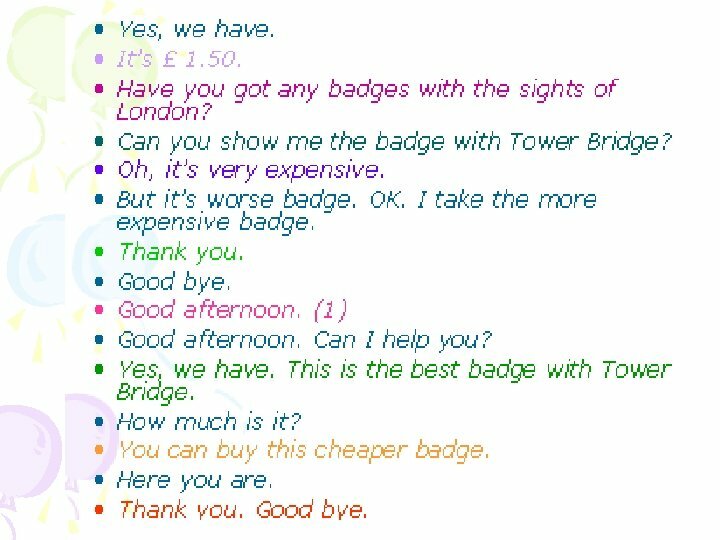 • How much is it? • Thank you. Good bye. n What did we do? 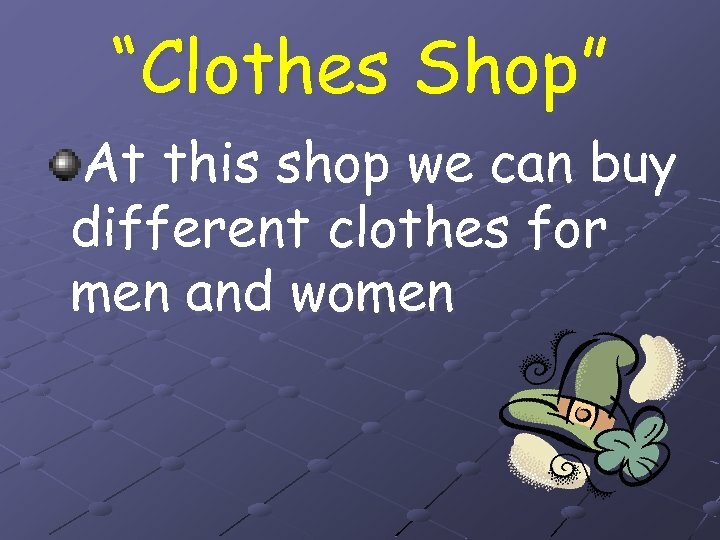 n What shop do you like to go? n What is the largest department store in Cherkasy? n What present do you want to buy for your mother? 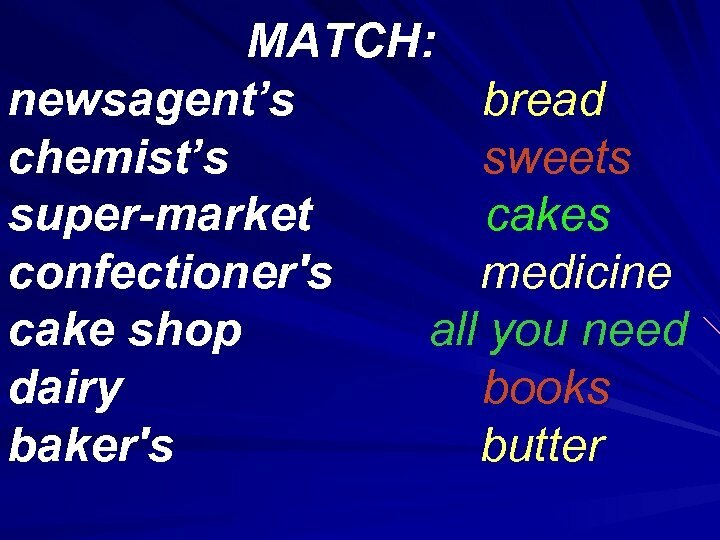 n What shop has a good choice of sweets?